What's in the fridge: Major Tom looking at the Mirror Pond. I'm happy (and extremely glad) that Deschutes Brewery of Bend Oregon is finally selling their tasty brew, so far just one, here in Vancouver. The other week I spied the Mirror Pond Pale Ale at my local store and after rubbing my eyes many times, took it home ala sixth pack to enjoy. For my faithful readers of my blog you know that I already reviewed this fine microbeer last year. I just returned from a trip to Portland and brought some back. A few months before that I was fortunate to taste their Black Butte Porter. After my frustrated post, Jason from Deschutes Brewery wrote me a reply. He informed me that they were looking into selling their wonderful beers up here. I don't have to wait ANY longer, they've landed! Now, I'm back to reading another William Fotheringham book, this time the much anticipated 'Put me back on my bike.' A biography on the great British cyclist, Tom Simpson. I've just started into it and unfortunately I have only empty bottles of Mirror Pond. I know. 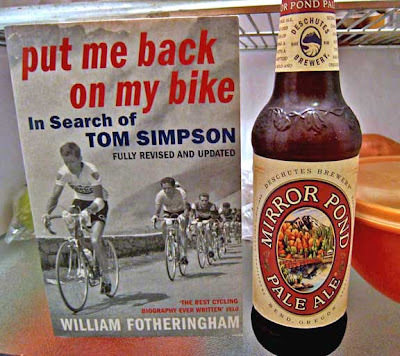 I'll soon return with a full book review... and get down to the store for some more Mirror Pond Pale Ale! Love Deschutes beers. Jubilale is my #1 alltime favorite by them. I hope it comes up here!